You need a kart steering wheel, or want to buy a new one? What kinds of steering wheels are out there? 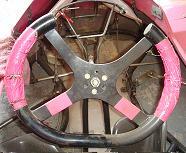 The steering wheels for karts range in size from 9 3/4" to 14". A circle is the primary shape, but there are others. This is just a plain old circle, with three posts in the center. Most of these are between 10" and 14" in diameter. As the title says, it's a circle, but at the top of the steering wheel it is flat. This uses three posts as well. You can find these between 10" and 14". There is also a flat bottom steering wheel, which is basically just the opposite of this one. This is a popular steering wheel. At 14" in diameter and an oval shape, it gives good range to steering. The top is also cut off to allow for better view if your on the shorter side. The picture above is one of these. Four posts hold it all together. These are used a lot in Enduro Racing. It's basically an oval steering wheel with the top or bottom. Four posts go out to the handles. Steering wheels come in different textures and grips. Some people prefer just a plain aluminum steering wheel with no grip on it. Others are have suede on them for a smooth soft feel. The picture at the top of the page is aluminum. Other ones have rubber or cloth grip. Kids should use the steering wheels designed for kids. Typically smaller than 10" in diameter. Figure out what grip you like, aluminum ones sometimes feel a little skinnier, and the ones with grip on them may seem a little thicker. Go Big! Having a bigger steering wheel gives you more precise control over how much you turn the wheels. - Very important on asphalt where being smooth is so important. Make sure whatever you do, that you can see clearly over the top of the steering wheel. So you want my recommendation? Well I'm flattered. =) If I were to give my recommendation, it would be the Cut Top Oval Steering Wheel pictured at the top. It's wide (14"), and if your short (like me) you can see better over the wheel.